Interesting fact about Rajasthan: Rajasthan, known as "the land of kings", is the largest state of the Republic of India by area. It is located in the northwest of India. It comprises most of the area of the large, inhospitable Thar Desert, also known as the Great Indian Desert, which parallels the Sutlej-Indus river valley along its border with Pakistan to the west. Rajasthan is also bordered by Gujarat to the southwest, Madhya Pradesh to the southeast, Uttar Pradesh and Haryana to the northeast and Punjab to the north. 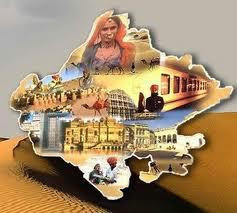 Rajasthan covers 10.4% of India, an area of 342,239 square kilometres (132,139 sq mi). Jaipur is the capital and the largest city of the state. * Rajasthan is one of the most popular tourist spots in India – well it has so much to offer. From the romantic forts and palaces of Jaipur and Jodhpur, the lake cities of Udaipur and Pushkar, the painted town of Shekhawati, the golden fort and sand dunes of Jaisalmer to the national parks of Bharatpur and Sariska. and not to forget the camels, the widely accepted representative of the state, threading their way through the streets and bazaars, at the traffic signals or making a beautiful silhouette against the sunset on the Sam sand dunes. * The history of Rajasthan dates back to the pre-historic times. Around 3,000 and 1,000 BC, it had a culture akin to that of the Indus culture valley civilisation. The Chauhans who dominated Rajputs affairs from seventh century and by 12th century they had become an imperial power. After the Chauhans, it were the Guhilots of Mewar who controlled the destiny of the warring tribes. Besides Mewar, the other historically prominent states were Marwar, Jaipur, Bundi, Kota, Bharatpur and Alwar. * The traditional dress worn by women in Rajasthan is a full length skirt and a chaniya choli or lehenga, which resembles a short top. The dresses usually are bright in color. * Some of the famous dishes in Rajasthan are Dal Baati Churma, Dai Shorba, Ker Sangri, Jaisalmeri Chane, Kadhi and various kinds of chutneys and pickles like Aam Launji, Lehsun ki Chutney, Pudina Chutney and Tamatar ki Launji. * Location of Rajasthan: 23° 30' and 30° 11' North latitude and 69° 21' and 78° 17' East longitude. * Climate in Rajasthan: Winter temperatures range from 8° to 28° C (46° - 82° F) and Summer temperatures from 25° - 46° C (77° - 115° F). In western Rajasthan Temperature difference in a day is more than 35° degree sometimes, like in day temp. is 48° and on same night you might get temp. in range of 10-15. * Major Festivals: Desert festival, Camel Festival, Kajli Teej, Gangaur Festival, Teej, Marwar Festival, Brij Festival, Mewar Festival, Summer Festival, Raksha Bandhan, Holi, Dussehra, and Diwali. * Major Fairs: Banganga Fair, Gogaji Fair, Kapil Muni Fair, Karni Mata Fair, Khatu Shyamji Fair, Nagaur Fair, Pushkar Fair, Sheetla Mata Fair, Shri Mahavirji Fair and Urs Fair.